Stealing food off the kitchen counter or tables is not only annoying, but potentially very dangerous. This is a bad habit for dogs to learn and practice. They can (and often do), steal unhealthy food items, such as chocolate, corn cobs, chicken or steak bones, etc. These can cause illness or intestinal blockages. Not only do we have to worry about food, but we have to worry about kitchen utensils, hot stove tops, and consuming inedible objects like socks or children’s toys. Incidences like this can result in expensive and dangerous surgeries or even death. That’s why you need to learn how to stop your dog from stealing food NOW. – Place safe food item toward the middle of counter top (let your dog see you doing this). 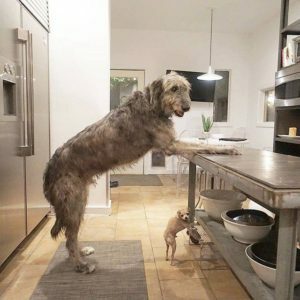 – Set up Doberman Security alarm at one side of countertop, so the invisible beam runs across and in in front of the food. – Exit the room, but stay close by, so you can immediately enter the room when your dog sets off the alarm. That enables you to turn the alarm off and ensure your dog does not consumer the food (preventing any unintentional reward). – It is important to repeat this sequence on multiple surfaces in your home, while using different edible food items. This helps your dog to generalize their understanding of not stealing items from counters or tables. There is more than one way to go about addressing anything. This is just one potential solution for you to consider. I typically recommend this first to my clients, as it is cheap, easy, quick, and effective for a lot of dogs. If your dog does not care about the audible noise this alarm makes or if you do not feel comfortable using this with your dog, then consult with a trainer who can work with you and your dog in-person. How to Stop Your Dog From Getting in the Garbage? The garbage pail and trash bags are prime focuses for so many dogs. There are plenty of intriguing smells and items your dog may want to play with or consume. However this is not only annoying for you, but more importantly, potentially very dangerous for your dog. You can use the above outlined protocol for this purpose as well. The only difference is that you would have the alarm set on the floor and having the invisible beam positioned so they dog will trip it just as they touch the garbage pail. Cat litter boxes and cat food are a point of contention for many multi-pet households. The cats feel infringed upon when they know the dog get into their space, your dog find it rewarding to do this, and you become frustrated and stressed. The steps outlined above can be one way to address this. The only essential caveat is that you make sure you have your cats away from their food or litter box when the security alarm is set up. You do NOT want your cat to be the one that trips the alarm, as it could deter them from approaching that area again. Instead, you need to artificially create the situation by keeping the cats in a different room, setting the alarm and letting your dog only have access to these area. Once your dog sets off the alarm, you can remove it and let your cats back. You may need to periodically do this in order for your dog to know that this still holds true. As I stated above, you must use your discretion and judgement as to whether this is something that is appropriate for your home and pets. If you do not feel comfortable doing this, then do not use it. I am only speaking from my personal experience with clients. If you want to keep your dog off furniture, click HERE for that simple and easy solution.